Some gunmen on Monday evening in Abeokuta, the Ogun State capital abducted a four-year-old boy, Stephen Kanu from his parents’ home in Laderin Estate. The gunmen were said to have stormed the home of the toddler’s parents and abducted him at gun-point. We gathered that the incident occurred while the toddler was playing with the family dog inside the family’s compound. His mother was also said to be busy with household chores when the assailant struck. The parents of the boy, Dr. and Mrs. Mucipay Kanu said that the gunmen who had pretended to be visitors knocked on the gate to the house, while the boy who was busy playing with the dog rushed to open the gate for them. The suspected kidnappers were said to have seized the boy immediately he opened the gate and took him straight into an unregistered waiting taxi parked outside and zoomed off. As the unregistered taxi sped off, neighbours who were at first scared by the action of the abductors gave them a hot chase. Some few kilometres away from the scene, the kidnappers who sped off towards Moshood Abiola Way, opened fire, shooting sporadically in the air to scare away the residents of the estate who were pursuing them. 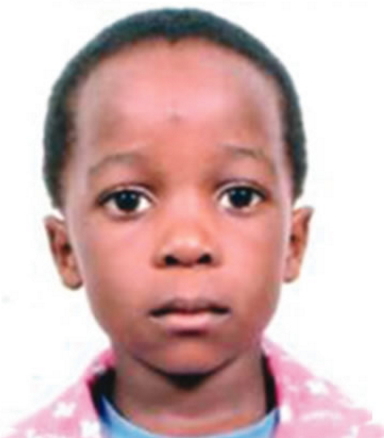 As at the time of filing this report, the abductors are yet to contact the family of the boy. The parents of the victim have however implored anyone with useful information on the whereabouts of their son to call these numbers: 08033258190 and 08060577733. The Ogun State Police Public Relations Officer, Abimbola Oyeyemi said all police formations in the state had been notified and directed to fish out the suspected kidnappers and retrieve the abducted toddler. Oyeyemi assured that the toddler would soon be re-united with his family. All this kinda news makes me scared to return to Nigeria with my most adorable daughter. Cause she is my life. I will kill myself without her. She is the reason I am alive. What an innocent child, your guidian angel will fish them out and keeps you safe. Dis is d end of dia carrier as kidnappers 4 abductin dis innocent boy. I lk 2 blv dat God has rzn 4 allowin certain tins happen. In dis case, i can c dt He wnt 2 use dis boy 2 expose his captors.